For the 90’s skaters reading this, you’ll remember that DCshoecoUSA’s, logos, videos and team have always held a special place in our hearts. They came onto the scene sponsoring some of the most influential skaters at the time that possessed the raw attitude and skill set of core skateboarding. I’m definitely talking about Kalis, Williams, AVE, Brian Wenning, and Danny Way. Their notoriety solidified this era of the DC team roster as legends in the history books. As a result, the skate demographic was hooked; shoes were selling off the shelves, middle school kids were drawing the logos all over their binders, and DC not only became a successful skate brand, but also a platform for new young DC riders to shine. The DC video launched in 2003, and put young guns Lindsey Robertson, Greg Myers, and Ryan Smith on the map. Since then, DC has gone through a tremendous change in their generational team roster, with notable pros such as PJ Ladd, Nyjah Houston, Chris Cole, Rob Dyrdek, Mike Mo Capaldi all joining and leaving for various reasons over the years. Today, DC has remained vigilant and progressive in a changing skate shoe market that is dominated by larger corporate brands. Despite internal affairs and shifts in the market, one thing has remained true to this day: DC has always sponsored the most iconic up and coming skaters in the scene. Their team roster right now is stacked. T-Funk, Chase Webb, Evan Smith, Madars Apse, Cyril Jackson, Tommy Fynn and Wes Kremer are just a few of the names on their roster, and each one is a more-than-worthy candidate for SOTY. But the highlight of DC these past few year has been the addition of Brazil’s finest to the global roster: Tiago Lemos. Tiago came onto the global scene by hitting us smack dab in the face with social media clips of his switch back tails, effortless pop, and also a feature in Ty Evan’s film “We are Blood”. Since then he’s only been pumping out more footage; he dropped 4 heavy parts in the past two years that has everyone on Youtube commenting “SOTY! 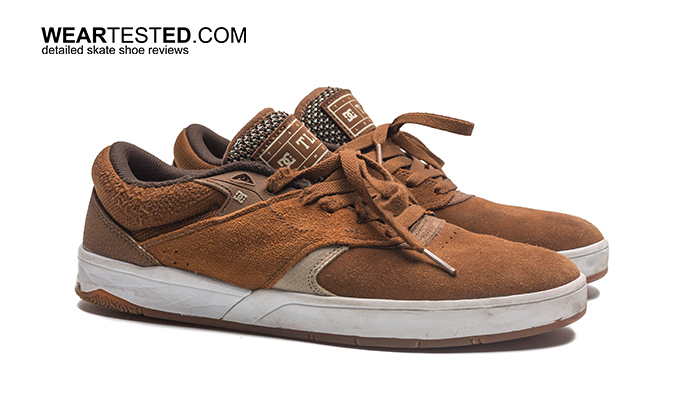 SOTY!” As a result of his hard work and raw talent, DC gave him a well deserved pro model just a few months back and hit us with an amazing opportunity to team up with Tiago to present not only this review, but an instagram best ledge trick competition where 3 lucky winners will receive a pair of the new DC Tiago Lemos shoe. If you made it this far, check the review below, and more importantly, stay tuned for our Weartested contest to drop. Starting 2/2, be sure to upload your best ledge trick video on instagram and remember to @Weartested, @DCshoes #LemosLedgeContest to enter! Contest ends 2/12. 10 Days, 5 winners, and Tiago’s judging. Send those clips in!! The DC Tiago Lemos fits true to size. The sleek silhouette of the DC Tiago Lemos model is outfitted with two main DC patented technologies when it comes to the shoe’s durability. The research and development team crafted both Super Suede and Super Stitch technology to cover all details of the shoe’s durability. The shoe’s upper is made of the Super Suede technology, which DC boasts to add 50% more durability to the shoe’s toe area. 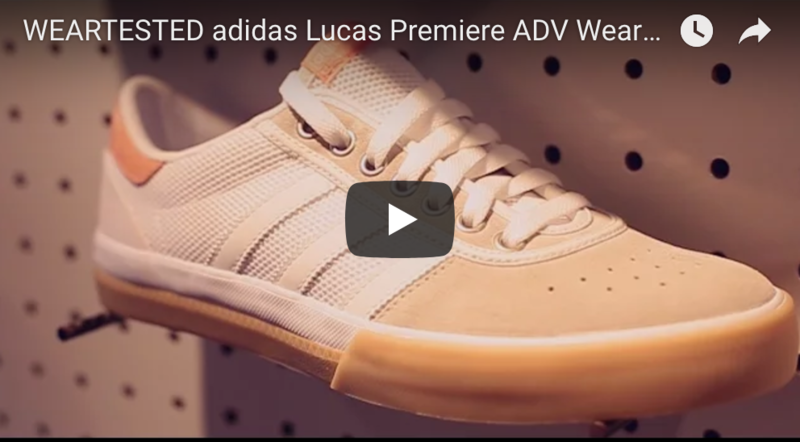 Although we were unsure of how DC measured this internally, we put the shoe to the test and noticed from our 10 hour weartest that the suede did not become extremely floppy. 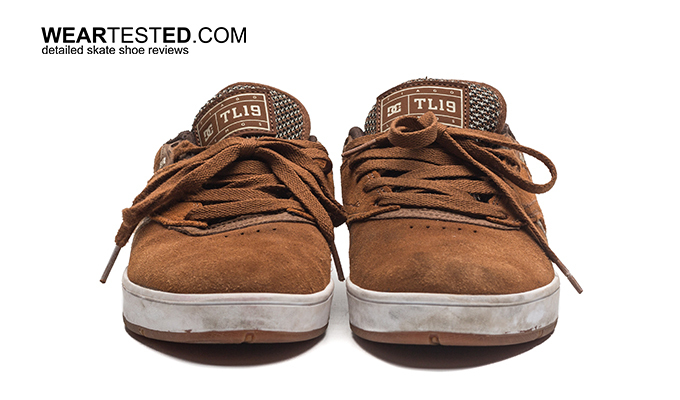 In other shoe’s cases, the suede toecaps would often absorb the foot’s moisture and cause a bit of rippling on the surface of the shoe; this paves way for more direct attack points from the grip tape and results in the shoe tearing open even faster. 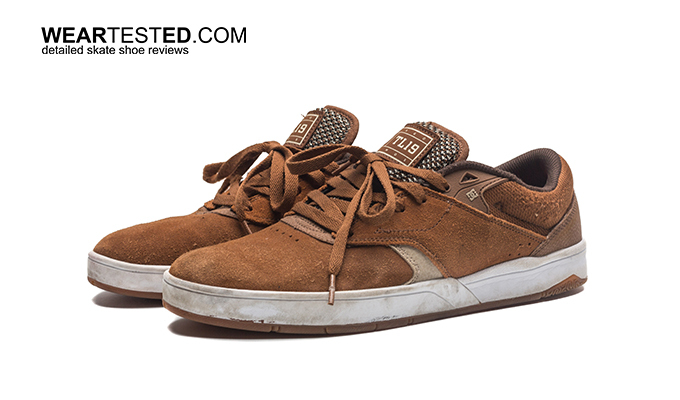 However, the toecap of the Tiago S held it’s structure throughout the whole weartest and the suede did not rip within the 10 hours of skating. Aside from the tried and true Super Suede technology, DC considered fine details of the shoe’s durability and added in their Super Stitch technology. 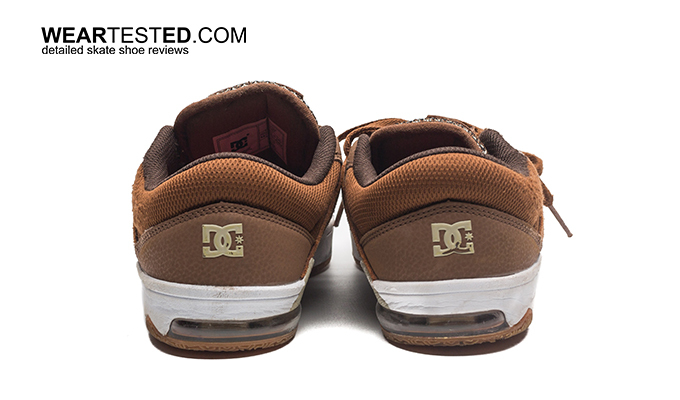 While most shoes will use a standard cotton strand stitching to hold the shoe panels together, DC created a high tensile thread stitching that makes it much harder for the griptape to wear down. This ultimately prevents the shoe panels from blowouts and increases the lifespan of the shoe. All in all, these two main technologies covered all standard requirements needed for great durability. In a day and age where skate shoes are slimming down and becoming more visually basic, the Tiago S is a refreshing take on an old school silhouette. Initially, the shoe looks bulky, and reminds us a bit of the 90’s with the airbag insert in the heel. But the Tiago S is actually everything needed in modern skate technology packed into a simple classic look. The shoe is quite padded from the midfoot to the heel, but tapers into a point significantly in the toecap region. From a bird’s eye view the shoe looks quite wide, but when the feet slip in, they are packed in quite tight from the padding around the heel collar and also sidewalls. The immediate eye catching cushioning element of the Tiago S is the airbag insert in the shoe’s heel. This is part of DC’s Impact technology series; previously the Nyjah pro model had Impact G technology, the Evan Smith pro model had Impact I, and now Tiago’s specific airbag-cushioning technology is termed as Impact A technology. The airbag itself is made of thermoplastic urethane, which is rigid enough to provide structural support, and flexible enough to absorb impacts. Another highlight of this Impact A airbag is that it reduces the weight of the shoe; the Tiago S is quite light considering the amount of technology and padding added to the shoe. Aside from this airbag, the shoe also features the iconic OrthoLite insole, which is extremely thin and serves more to provide comfort than protection. With that said, the cushioning elements for shock absorption rely mainly on the Impact A technology. Another element of cushioning that helped with the overall performance of the shoe was the padding around the heel collar and sidewalls. When it came to the weartest, the security of the padding and the Impact A heel cushioning kept the feet out of harm’s way when jumping down stair sets and gaps. The boardfeel of the Tiago S was surprisingly better than expected. 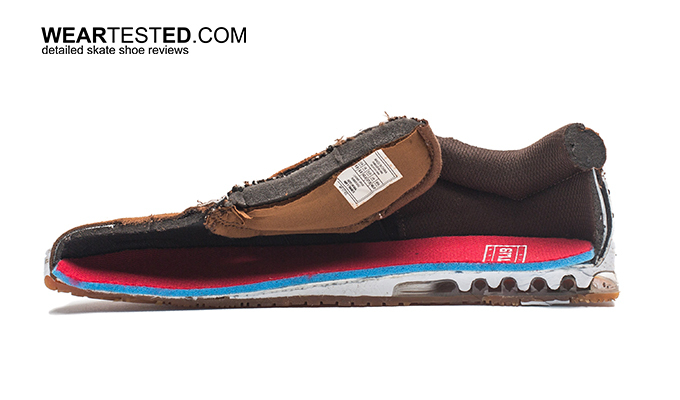 At first glance, the sole of the shoe, the cushioning elements and the sheer stature led us to believe the shoe was quite bulky with limited boardfeel. But keep in mind, Tiago helped design this shoe, and he’s known for destroying J-Kwon plaza’s ledges with his technical wizardry. As a result, he wouldn’t have designed a shoe that couldn’t handle technical ledge skating. Initially skating the shoe, the boardfeel took us about 1 hour to break in, after that one hour the boardfeel adapted more to the concave of the board and sole of our feet. As for grip, the rubber outsole of the Tiago S features the standard DC pill tread pattern, along with a finer tread pattern in the forefoot and heel. The grip was fine; no blowout spots appeared in our 10-hour weartest. Impressively, the Tiago S had different technical elements that worked together to create an extremely stable foothold. As aforementioned, the heel collar and sidewalls were heavily padded to ensure a snug fit for the feet. If you look closely at our cross section cut, you’ll notice that the midsole arches upwards, which helps stabilize the midfoot to heel. In addition, the tongue of the shoe is a crucial element in providing both stability and comfort; the tongue features elastic straps to lock the feet in, and is also made of a jacquard style mesh material, which allows heat to escape efficiently. 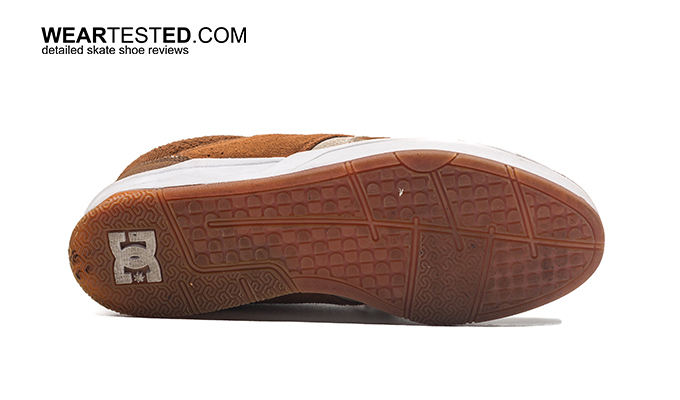 Overall, the shoe was extremely comfortable to wear and the stability was a highlight of the shoe. The DC Tiago S is a sleek and technical tank of a shoe; it excels when it comes to durability, stability and cushioning, but could use a bit more for grip and comfort.